Sunday is the New York City Marathon! I feel like this year especially, the vibe in the city is going to be amazing for all the runners, since the marathon didn’t happen last year and this part of the country was rather distracted by sad, discouraging things as a result of Hurricane Sandy. I am heading up on Friday morning to work at the expo all day Friday and Saturday (8 AM – 8 PM…bring on the insanity! Just kidding, I’m totally not mentally ready yet). The NYCM expo last year was a big week for me…if you’ve ever had a moment you define as a “turning point” in your life, you understand. I can’t pinpoint one thing that made it like this for me, but I came back to New Jersey feeling like there was “Before NYC” and “After NYC.” Or more accurately, “Before and After Sandy/NYC.” It wasn’t the first expo I had worked, but it was the first at which I felt truly immersed in the running industry community. This was strengthened by the fact that staff from other stores had flown in from across the country to work with us that weekend, and I was finally getting to meet them! At this time, I was still interested in pursuing job opportunities within the field (more on this later, but there’s a reason I avoid writing about it), so this was a “day-in-the-life” experience for me to the extreme. Not to mention the experience of being there when rumors were flying about the cancellation, people were being denied their bibs after cancellation (that didn’t last long…), and the official announcement was made. The run in Central Park among a sea of orange shirts, many runners speaking different languages, just solidified the entire weekend. 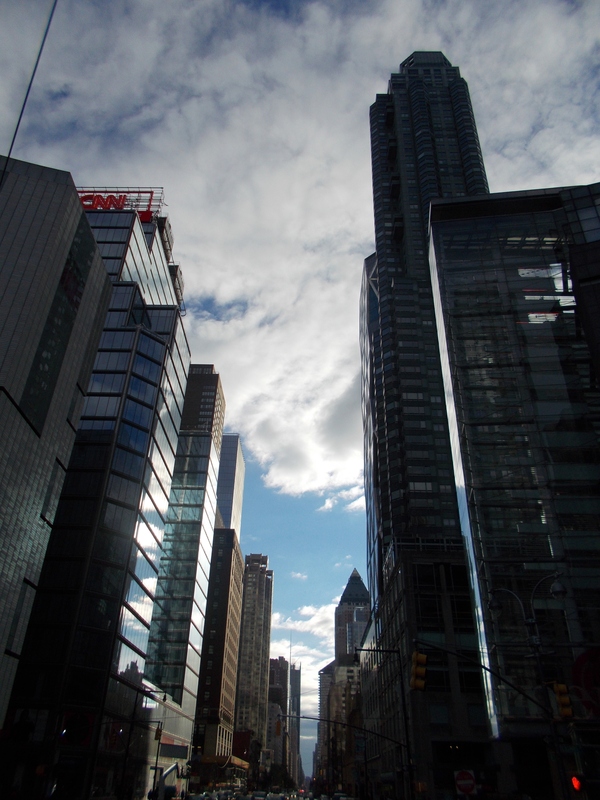 A combination of all of these things – and an escape from my wind-beaten, electric-powerless town – made my first true NYCM expo experience like stepping into another life for five days. I can’t believe a year has passed…wait, I can…since this monumental weekend of meeting new friends and coworkers and witnessing the power and unity of the running community. I remember signing up for Twitter as soon as I got home (but not using it until February…) and asking a friend about how to start a blog. That’s how much I wanted to write and reflect on my mixed-emotion experiences that week. 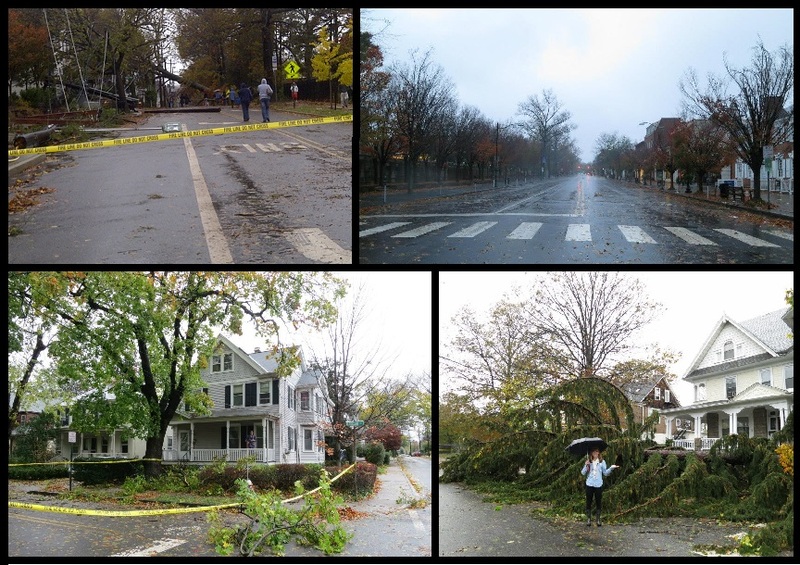 Here’s a look back on the 2012 NYCM weekend in pictures. 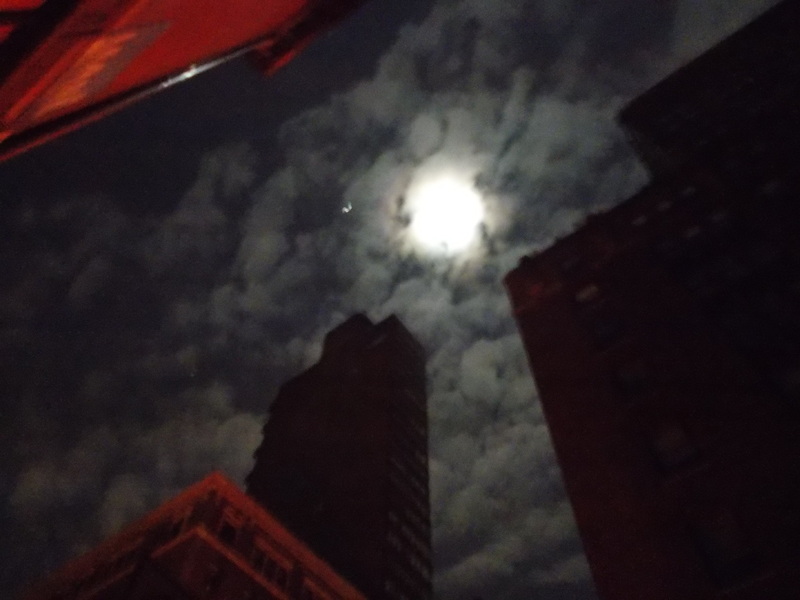 The only time the moon shone brighter than the midtown/LES skyline. 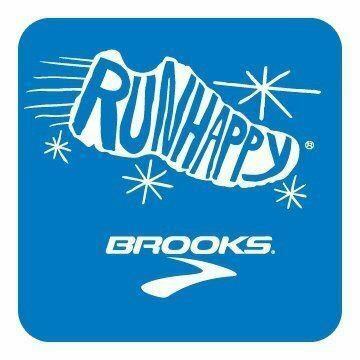 The day I got to sell Brooks shoes all day (sometimes in French…) was awesome. 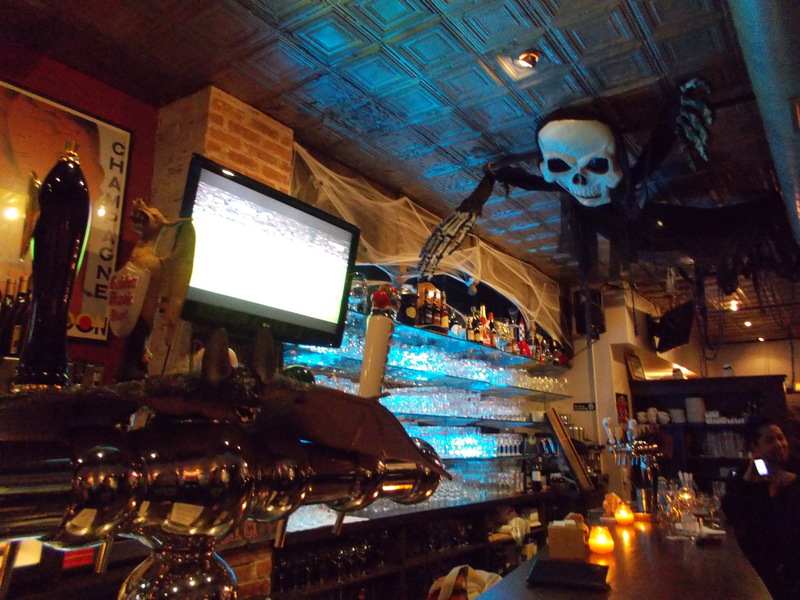 Jack O’Lanterns at Heartland…one of the best dinners of the weekend. Clearly, this post isn’t really about the marathon itself. Those posts can be saved for those of you who are actually racing this weekend! Good luck to everyone and relish in the energy. Someday I’ll run New York, but I’m not in a big rush. (I clearly need to get my priorities straight before committing to racing on a Halloween weekend…). If you’ll be at the expo Friday or Saturday, I’m assigned to work with CEP allll day Friday (8 AM – 8 PM) and with Garmin alllll day Saturday (8 AM – 8 PM again). If you come and say hi, I would love it if you also gave me some free food. I know it’s around at the expo…but sometimes we can’t escape (and Gu Chomps do not agree with me for lunch!). Expos are hard work but they’re worth it because I get to see so many people I am acquainted with through running, all in one place. Good luck if you’re running NYC! Visit me at the expo! 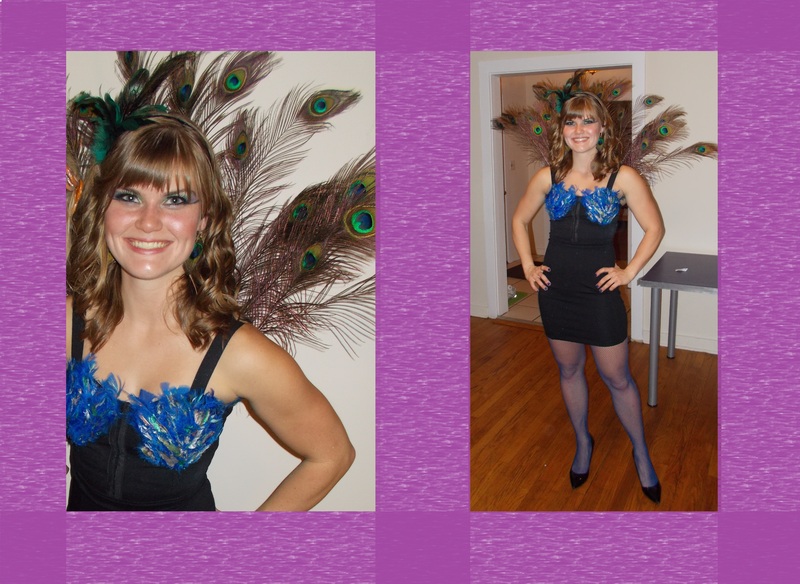 My first order of business going into the weekend was Halloween, as I mentioned previously. It did not disappoint. In fact, now that the real Halloween is still to come, I’m quite concerned about how fun it will actually be. Probably not nearly as much as round one. Anyway, I’ll post a costume picture so you know what the final result was. The rest of the weekend was pretty great, and it included a 14-mile run on Sunday before work. 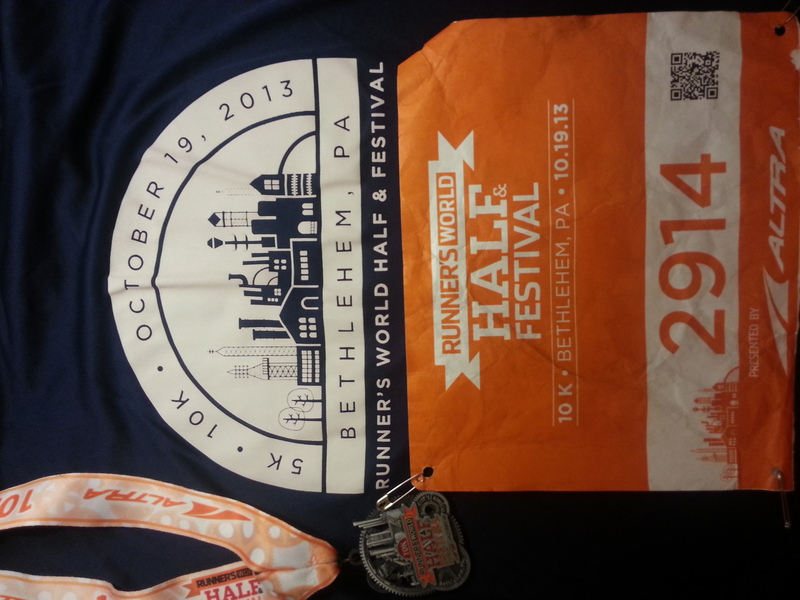 A few things about the run….It was hilly. I don’t know why I mapped a route with steep climbs at mile 2 and mile 11, but that happened. The reward for the first was the scenic Mountain View Rd., which Kate showed me back in February. It did not disappoint. I was only planning on running 13 miles, but it turned into 14 due to a bathroom excursion (it was locked! What a tease!). It was so nice to enjoy a long run without having to worry about a race; the Perfect 10 was two weekends prior, and the Runner’s World 10k was last weekend. It’s like too many parties: there is definitely a limit; sometimes I just need a solid, steady long run on which I don’t care about pace at all. I wore my Garmin but turned off the tones. The result was an average pace of 7:51. Looking back later, my splits vary quite ridiculously, but that was due to the sudden elevation changes, I think (I went from a 8:16 twelfth mile to a 7:16 thirteenth mile!). It was finally cold enough to warrant gloves (46 degrees)…but not cold enough for me not to sweat profusely through a short sleeve shirt and shorts of course. I used this for my warmup and cooldown for the first time….clipped it to my tank top/bra in the back. I didn’t feel it at all and I felt safer! I know it sounds like it sometimes, but I don’t always have an incredible run. My interval workouts aren’t always perfect, and I don’t always have the mental stamina when I set off to the track or all throughout the workout. On Tuesday, I had off from work. I could have done a workout in the daylight at any time. I could have done an easy run, because I had slight ITB paranoia after Sunday’s run (spoiler: I’m fine now). But I went to the intervals practice to meet the group. And I am so glad I did. On my cooldown, I asked myself, why was I ever considering not going? We all brought headlamps, and we were little bouncing beams of light bobbing around the track, for 12 x 400m. I had no idea what pace I was running when we started, since it’s always hard to judge depth perception and whatnot. I came through in 84 seconds, and thought that was a little fast. Then I hit 84 again. I strung a few 85s in a row, hit 86 just once, then steadily ran 85 seconds for most of the remaining quarters, with one or two more 84s, and an 81 closing lap. Conclusion: I’m pretty certain it was my fastest 12×400 workout ever, especially at that effort level, and that workout was a weekly staple during high school track. Any time I break through a barrier like that, no matter how minute in the scheme of things, it makes me happy. 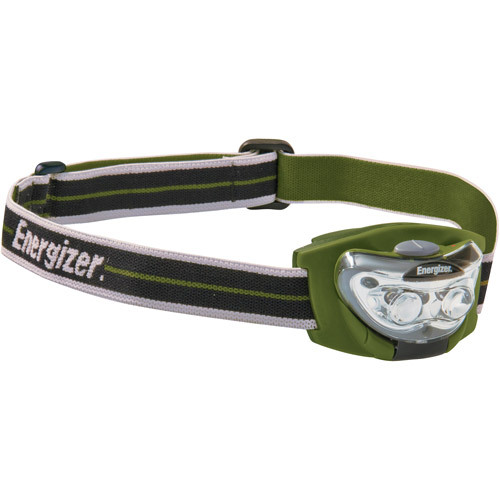 Headlamp on the track: not so bad. Speaking of happiness, now that running is finally loving me back after all these years, it’s becoming the only time I truly feel 100% strong and confident in my ability to plan, and execute that plan. Sometimes I think about other things when I’m running and that statement applies, sometimes it applies to just…more running. Either way, as I wrote about as a tangent in my RW 10k race report, I have been loving writing. Running and writing have been the two things lately that just make sense, and make me feel organized and in control and accomplished and happy. The fact that they can go hand-in-hand is nice, because basically, I can write and write, and then I can run out all the things there are no words for. There are, inevitably, things I want to write about that aren’t blog-worthy. At least, public blog-worthy. I used to write in a journal every single day…until a day when I didn’t want to recap my life, or think about it any more than I had to. When I finally got over that, I “caught myself up” on everything, then immediately got tangled in crazy confusion again and had no time to write. I could really use it now though. I changed the end of this post’s title to “a little more on writing.” It said “non-running crises” before. Dramatic much? But that’s just the thing: why not be dramatic? It makes life interesting. I say “a little” because there is more to say/ask/ponder about this later. It should be known that Halloween is my absolute favorite holiday of the year. That being said, it always causes me a ton of stupid, unnecessary stress in the weeks leading up to it. You see, in my mind, Halloween is a time when I can go all-out and be really creative with creating a costume – basically turning myself into a piece of artwork. The stress comes into play when I realize I only have one chance during the year to do this! Therefore, it must be perfect. Hello, self-pressure. Another challenge is making sure I have everything I need to buy before stores close for the day, which is sometimes difficult with my work schedule (I’m usually not done until 7 or 8 at night). Yet another challenge is…trying not to actually buy too much. 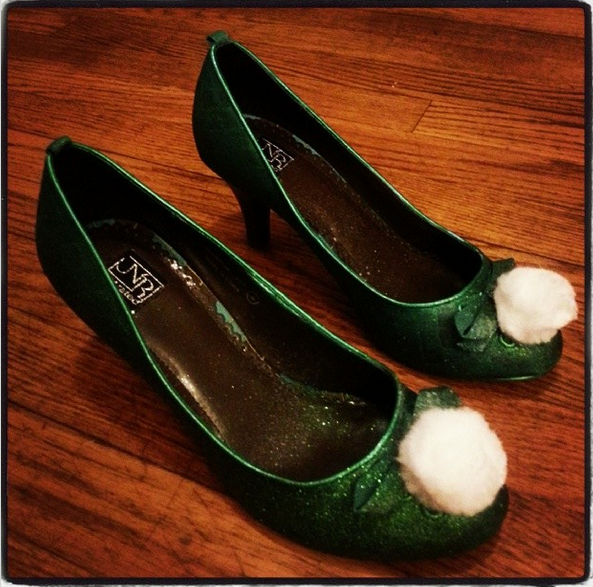 Needless to say, I am ready for Halloween Season 2013 to begin! I say “season” because if you celebrate Halloween like I do, it’s not just October 31. So before I spoil the surprise for this year (it’s not totally finished yet…but needs to be by tomorrow, yikes), here’s a look back at some of my costumes since I started this DIY costume madness. I figured Gaga would go out of style, at least Halloween-costume-worthy style, if I waited another year to do this, so I went for it. I looked at photos of a bunch of her crazy outfits and created a Gaga-inspired one of my own. A good place to start for nearly any costume is a black dress. With a glue gun, spraypaint, and other random things, anything is possible from there. I was a Hershey Kiss for Halloween when I was three. Why not recycle an old idea (that certainly was not even mine the first time around…)? 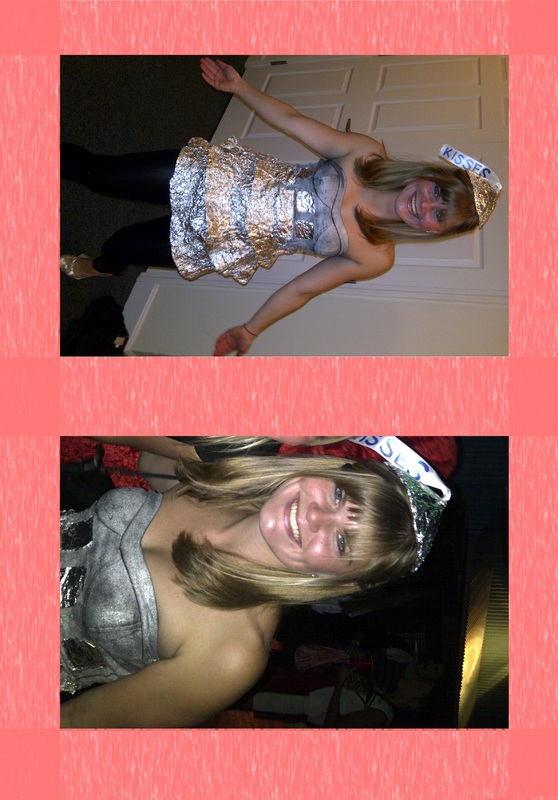 So, eighteen years later I was a Hershey Kiss again. I thought the shape of the Gaga dress from the year before would work well, so I spray painted it silver and hot-glued aluminum foil pieces to the tiers of fabric. 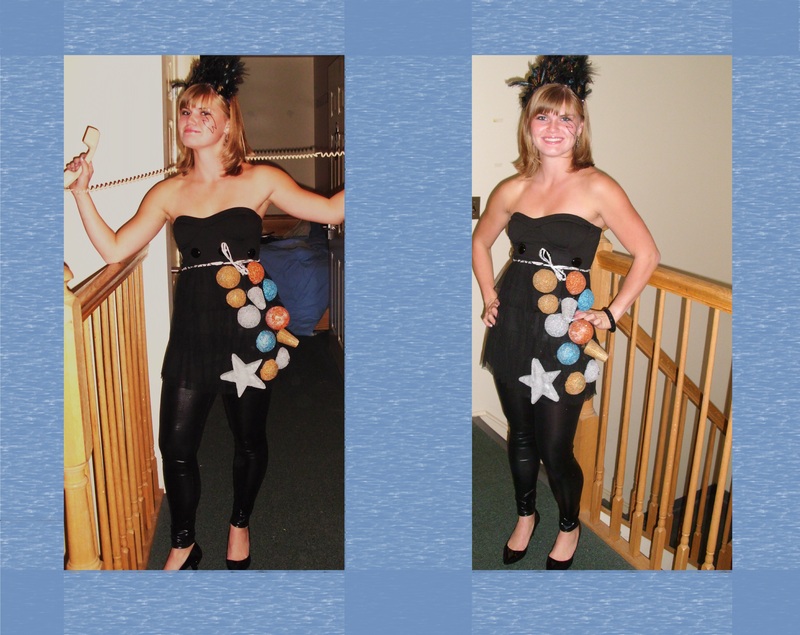 This was the hardest costume I ever made. It also didn’t last for more than one party. I sort of want to forget Part 2 even happened, because a.) the Halloween excitement certainly got the best of me that night and b.) the costume was awful. The Hershey kiss had fallen apart and I’d run out of glue sticks with which to repair it. It was snowing outside, I didn’t feel like driving to a store, and I had two parties left to attend. What to do? 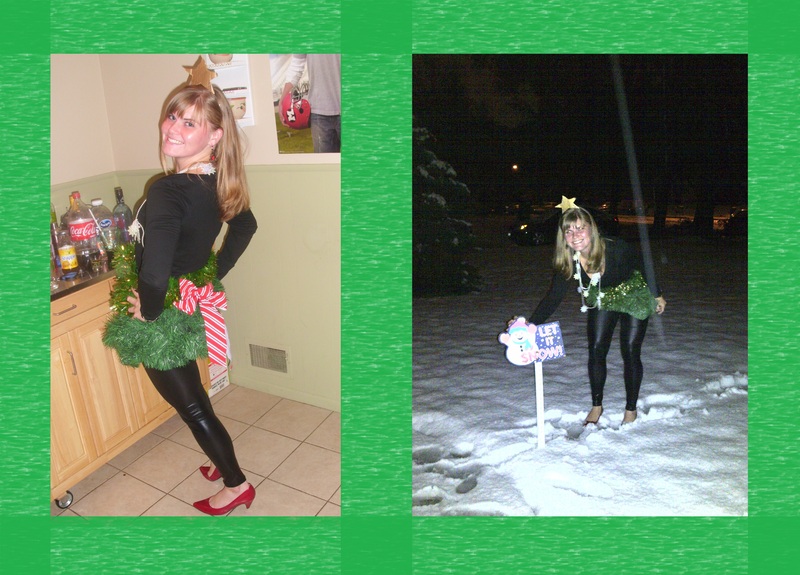 I raided the closet of the house I was renting senior year of college and found lots of Christmas decorations. And put them on. It was ridiculous that it was snowing in October, so I might as well make fun of mother nature, right? Conclusion: Part 1 was better, and there are hardly any pictures worthy of posting. I told you it was bad. This idea came to me randomly and I totally ran away with it. It was so much fun. And I could re-wear it at any time, because it didn’t fall apart at all. By the way, this is my first EVER Instagram photo. So exciting! I’m either going to use it all the time or never again. To find out, follow me here. An update: Thanks for the comments on my last post! It really helped to know that other people didn’t think I came off as ridiculous for wanting my results to be accurate. The good news is…they now are! Cheers to published, accurate PRs! I ran the 10k in 41:46 on Saturday; that is the time on my watch and the approximate time I saw on the clock as I approached and crossed the line. Chip time and gun time were probably a second or less different (I was really close to the front). So, what essentially happened is I was given a random time that I might have ran had I not made the moves I made and stayed strong over the last couple miles. Good one, Runner’s World. Very funny. This got me thinking. The race timers did not physically pick me up and not let me cross the line until the people I had worked hard to pass in the last few miles went by. They didn’t make me run farther or shorter than anyone else, or give me some other kind of penalty. I ran 41:46 for 10k, a PR, with a ~19:59 last 5k. Those are facts, and thanks to Garmin and a map and a stopwatch and my own vision of the clock (and hopefully finish photos…come on Brightroom, hurry), I have proof. The point of this post is not to show proof (I already wrote all about the race, after all), but rather to call myself out for really caring about this. Why do I care so much? We all want credit for our accomplishments, I suppose. Especially in such a case as this, where I was given a time that doesn’t reflect the work I did at the end that caused this to be the breakthrough race for me that it was. If I ran a race every weekend, it might be different. But at the rate at which I am racing, I try to make each race count for everything. When I’m done, of course I like to see my official time, how I ranked against others, and where I would have placed had I not negative-splitted like I did, etc. I don’t really have any opinions on this, or any more interpretations of why I’m so bothered by this saga. I’m just recognizing the fact that published, searchable, official results matter more to me than I realized. Tell me: would this situation bother you too, or am I way too competitive with myself and others (do I really need to be slapped)? 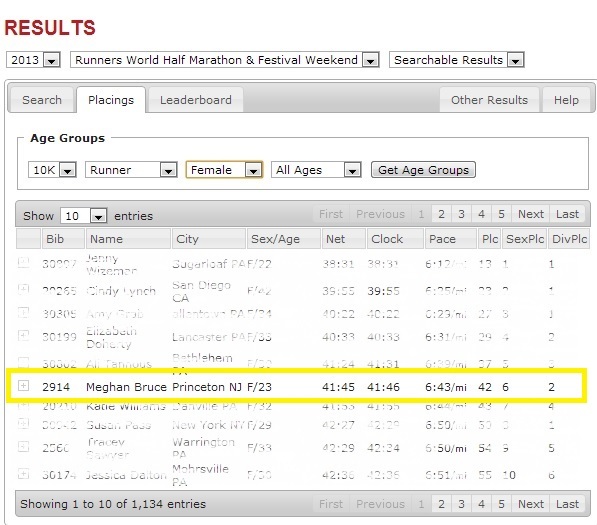 Does the [current] result listed as my time take away from the fact that I ran faster, and actually beat that woman listed ahead of me on paper? How do you learn to just be content knowing your actual results when errors were made in the online results? If a tree falls in a forest and no one is there to hear it, does it make a sound? If you set a PR and throw down against your competitors and it is published as if you did not, did you really do it? By the way: check out my Run.com RW Festival recap here. It’s pretty similar to my race recap on here, but give blog.run.com a follow if you like what you see. 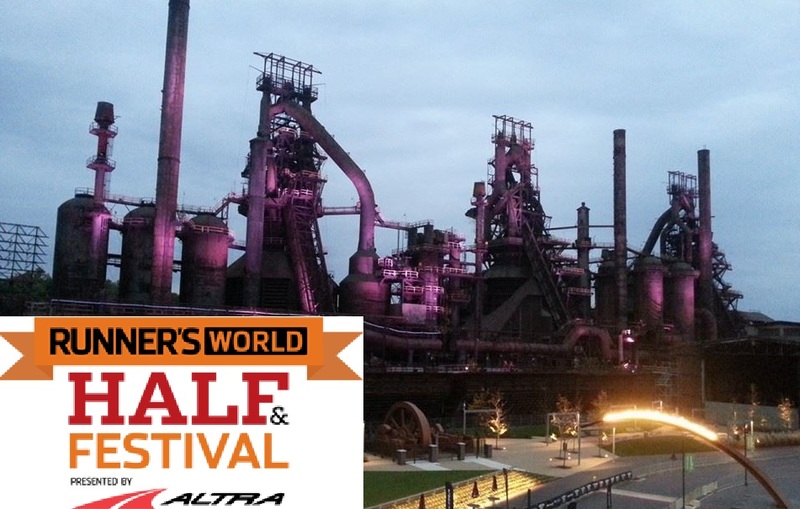 If you follow a lot of running blogs, you probably heard about the second annual Runner’s World Half & Festival in Bethlehem, Pennsylvania. 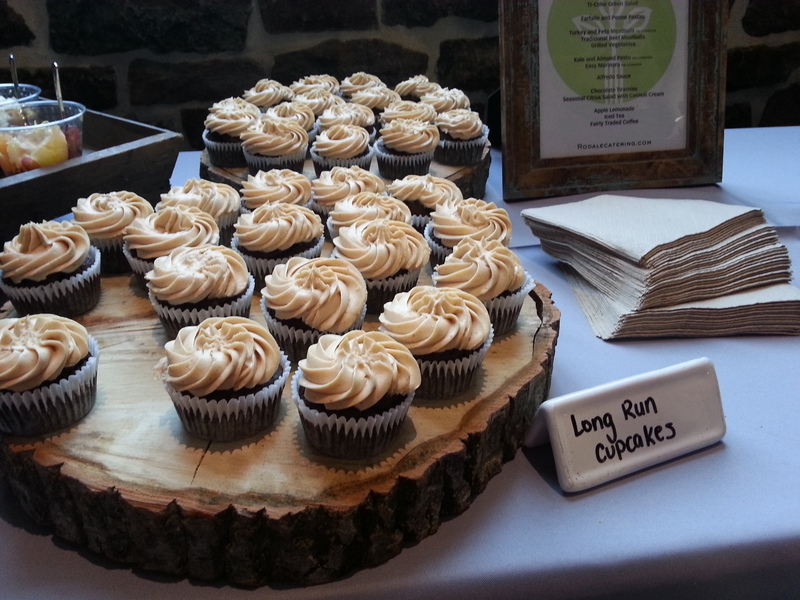 Runner’s World invited a group of bloggers to the event for the weekend, where they toured the RW offices in Emmaus, attended seminars, and were entered in the hat trick (5k + 10k + half marathon!). So, there was undoubtedly a lot of promotion going on via the blogosphere the last couple months! I was not one of those bloggers, but the event did intrigue me, particularly because: 1.) 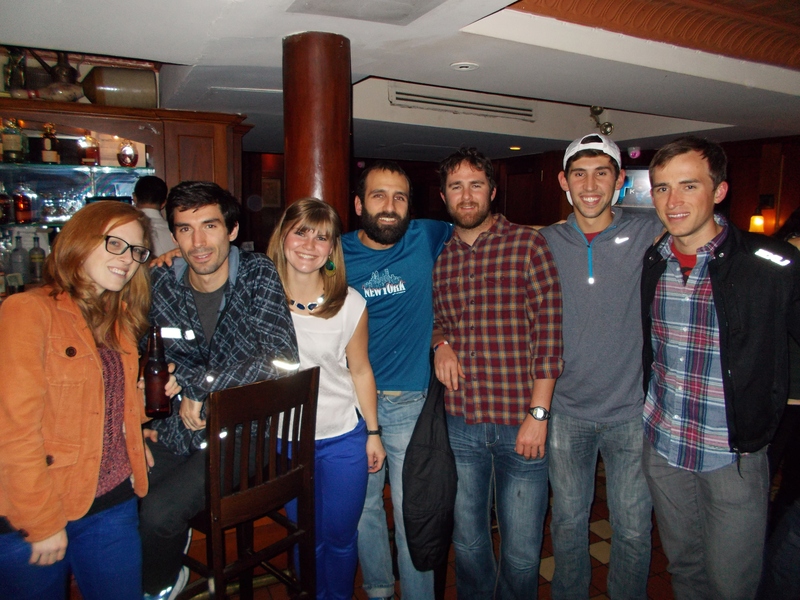 I’m a running nerd and thought it would be cool to meet the RW staff, 2.) 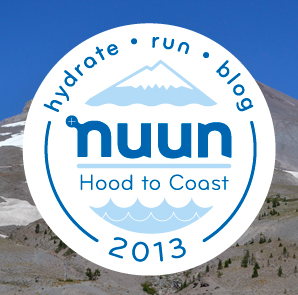 I already did meet Megan and Hannah (RW reporters) at Hood to Coast (they were also on Nuun Team Watermelon!) and it would be great to see them again, and 3.) why not??? 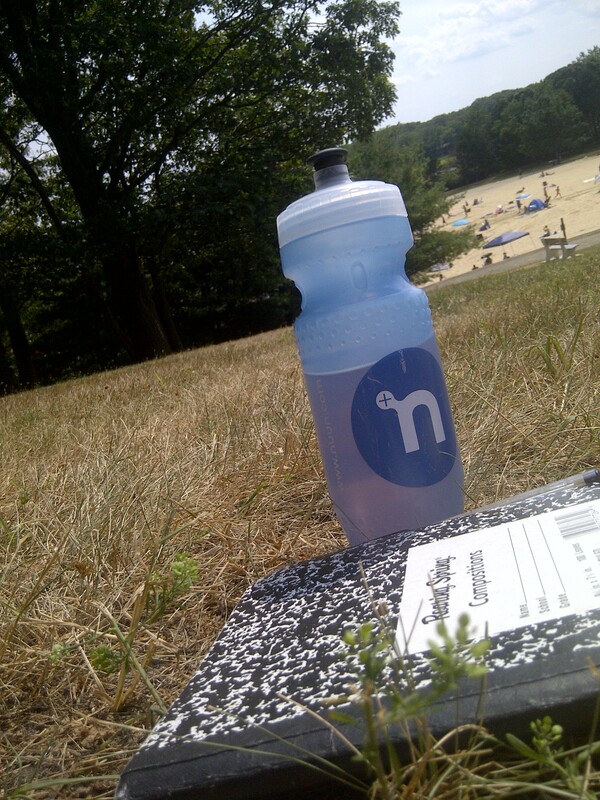 It was about time for a little running-related adventure outside of NJ anyway. 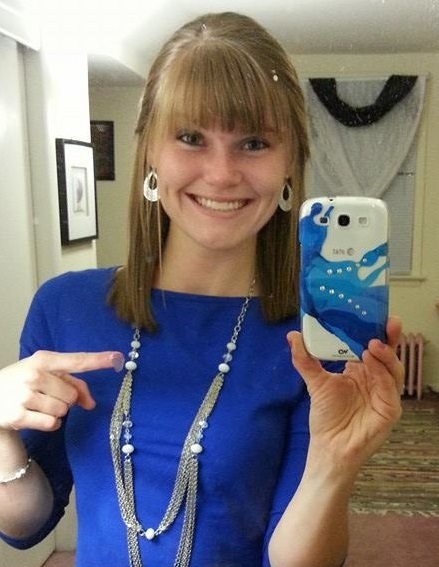 Look, new phone! Blackberry Torch –> Samsung Galaxy after 2+ years. 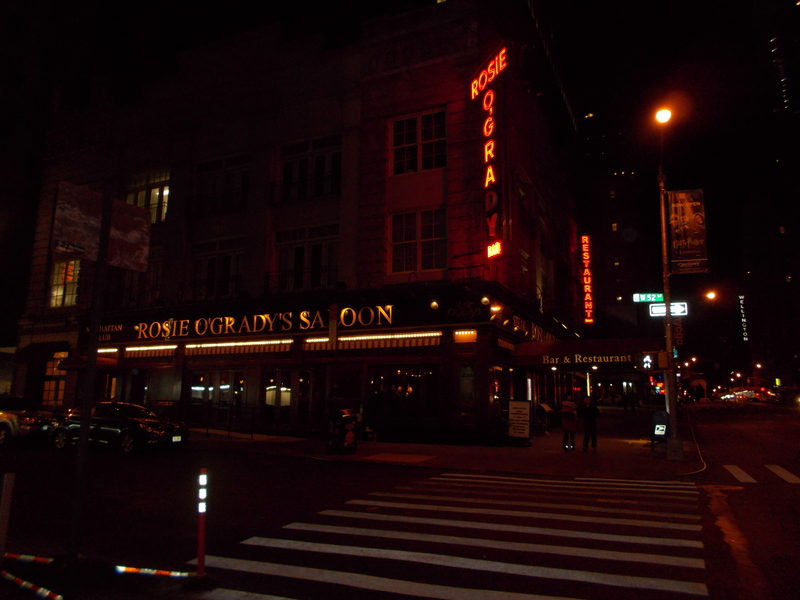 So, I forked over the money for the experience…on Tuesday night, a bit last minute. This is my new thing, apparently. AND IT WORKS. I woke up early (by my new phone – so exciting!) 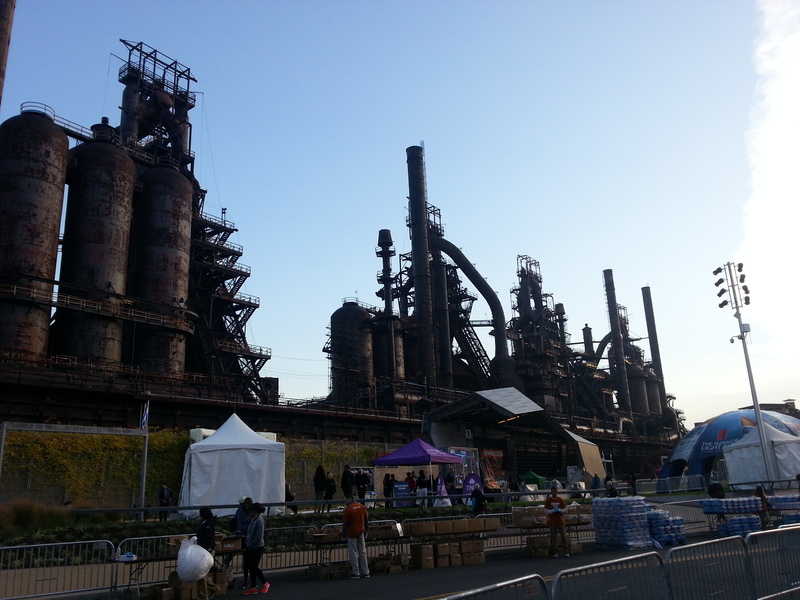 and drove the ~75 miles to the ArtsQuest center in Bethlehem, right next to the famous steel stacks. I had done this drive before many times (let me see…seven times), to either watch a meet or race at Lehigh and Moravian in college. After some debate over what to do about my “long run,” I decided to do an extra long warmup and try to time it so that I wouldn’t have much downtime before the 10k started. 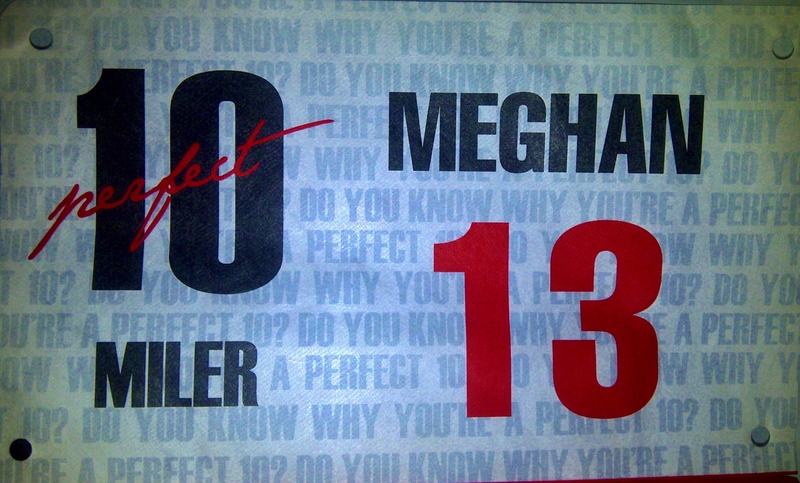 I got my bib number and ran into Megan right away! Then I set off on a warmup/pre-race run that ended up totaling ~5.6 miles at just under eight minute pace. It was cold, so this helped a lot! At the starting line, they played very intense pump-up music. I was feeling really chill and relaxed, so I tried not to let the music get me too excited. Negative splits were the name of the game. Bart Yasso and Summer Sanders started the race, and I was able to get a good view since not too many people lined up between the 6:00 and 7:00 pace signs. 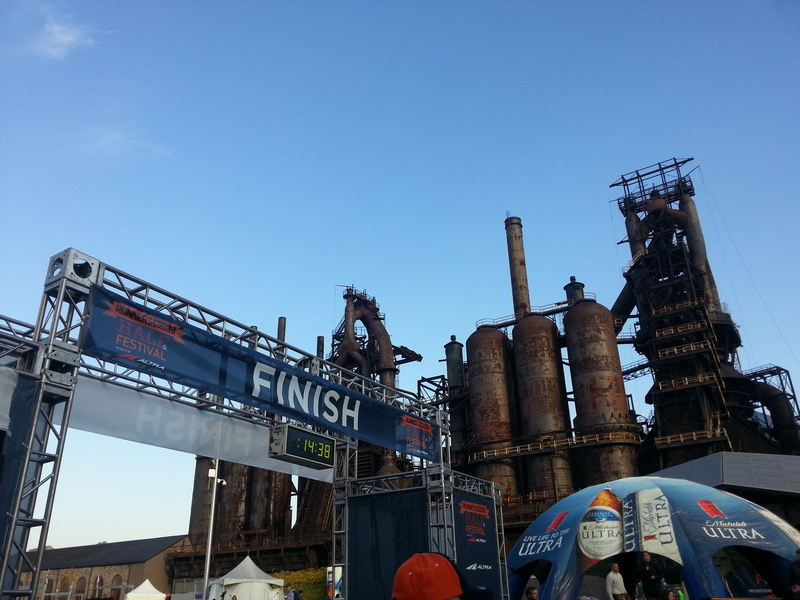 View of the steel stacks from near the start. I settled into a decent pace feeling comfortable, and I was glad it wasn’t too fast, because the first mile included a pretty big uphill. I passed the mile in basically seven minutes, which concerned me at first, just because I knew that was not an average pace I wanted to run; it was too slow. I convinced myself I had a plan and was being smart though, and just went with it. The downhill came soon after, and I was instantly glad I’d conserved the energy. A quick glance at my watch told me that “just rolling” with the downhill had me close to six minute pace, so I knew then that everything would even out. We crossed over the river on a bridge and headed into the little downtown where I had warmed up earlier. There was loud music playing at the end of the bridge, and at first I was pissed it was Bruno Mars (cannot stand him, sorry), until it turned into a pretty sweet remix, not going to lie. Good sign. I could see Susan a couple runners ahead of me, and let her plus some guys in neon shirts (seriously, neon yellow was the color to wear in this race; I missed the memo) pull me along. I was still feeling really comfortable. I think my effort level stayed steady or increased with each mile of the race; the pace variation is purely a result of the uphills and downhills on the course. The spectators were great; if they were standing at the crest of a hill, they always seemed to say, “top of the hill!” and it made me feel better. Before the fourth mile mark, I think, I found myself gaining ground on the runners ahead of me, then passing them. I wanted to practice making a decisive pass, not a let’s-run-together pass, because I wanted to run my own race and see how much I could negative-split (new game, it’s been fun, and painful). Luckily, after that was a significant downhill to the bridge again. I was hauling it on the bridge because first, I love running over bridges, and second, I wanted to keep the momentum from the downhill going. 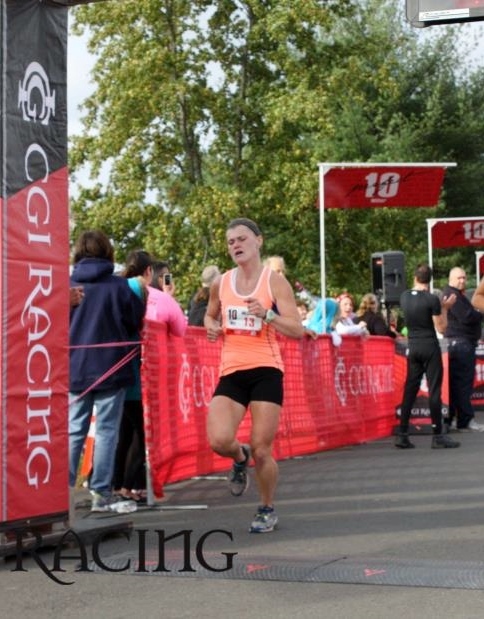 There were a lot of race photographers and I made it a point to not look like I did at the end of last weekend’s race. Silly, I know, but sometimes looking calm and controlled = feeling calm and controlled. And besides, the race was not over. A guy on the bridge said to me as I passed, “I counted you as fourth female.” I’m going to go ahead and spoil this for you by saying: LIES. This was a false statement. I’m not disappointed that he said it though, because it fueled my fire for the rest of the race. After barely missing first in my age group and fifth overall in the Perfect 10 last week, and wondering if I just didn’t finish tough enough, I was determined to negate all that and make up for it this week. I wanted to give everything I had and see what happened. I could see the next girl ahead of me once over the bridge, but I wasn’t sure if she was close enough to catch. I kept rolling along at the same pace though, around 6:25, without letting the faster pace get to me mentally. I wasn’t going to slow down if I didn’t let myself slow down, simple as that. On a stretch of road heading to the Sands parking lot entrance where we turned left, I managed to catch her and pass her. Decisive pass decision number two was a lot harder; I was moving faster and there was only a half mile or so to go! We went under an overpass/walkway or something, and then I could see the finish chute lined with spectators and the finish line with the arc of fire. I ended up crossing the line at the exact same time as another guy, and someone announced my name in the same sentence as his (this will be important later…), and then they said my name and town again. After the race, I tried to get in an adequate cooldown but that didn’t work very well. Oh well. I ended up meeting Jocelyn and Susan and heading over to the awards with them. I was pretty sure I placed, thanks to the man on the bridge who can’t count. But my name wasn’t coming up in the searchable results. I found out I definitely wasn’t top three, which was okay (that would’ve been really cool but also would have been surprising! ), but they also didn’t call me up for any F20-24 awards. Huh. Long story short: I was confused and really hoped my bib had registered when I crossed the line. They had said my name, that had to mean something?! It turns out it took longer for my results to show up, so I did place (second I believe), but someone else got to go on stage and get the award because the computers didn’t show my name. 😦 So that was sad. The results still show a time that is over 20 seconds slower than the time on my watch, and they don’t show me finishing within a second of another guy (which happened, photos will tell), so I’m actually not trusting anything for a few days; maybe they need to sort things out. They are a magazine, not a timing company, after all. 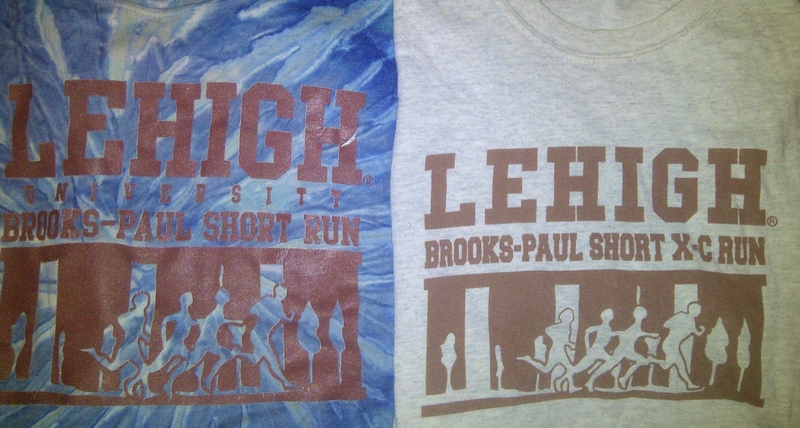 I might write more general thoughts on why Brennan would have likely slapped me in the face during this mental freak-out of mine in another post….I ended up not needing to pretend I was a Lehigh athlete (wearing this shirt…yes I did pack it; I go to extreme measures for showers sometimes) or drive over a mountain to sneak into a shower facility thanks to my gracious new blogger friends (Nuun Hood to Coast Team ’11 and ’12, by the way!). ReNUUNion! I admit I’ve been waiting to use this term since my flight out of Seattle. 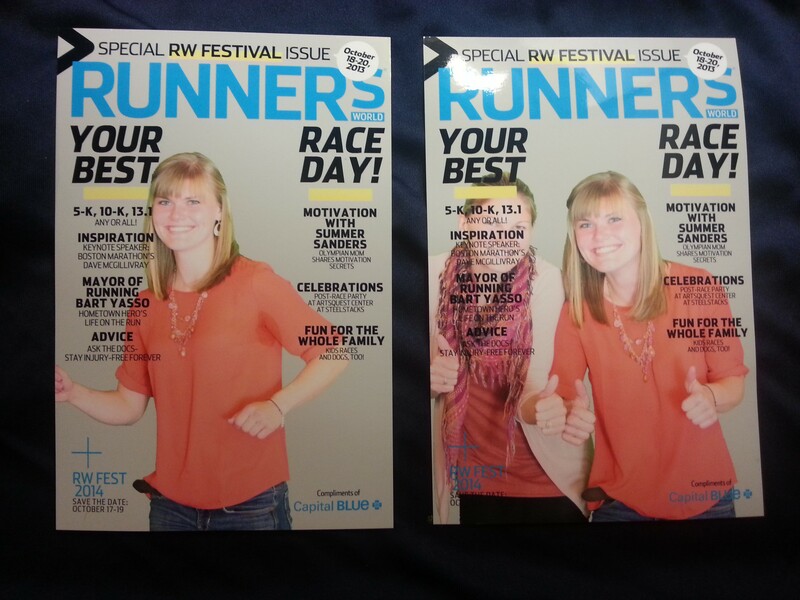 Poor Jane…this is why there’s only one runner on the cover at a time! At 4:30 I went to a “dinner with the editors.” It was a lot smaller than I expected (I think I was thinking of the Boston Runner’s World party when I signed up for this), but the food was really good! I sat with Megan and some other bloggers, plus two other RW staff members (one was a photographer I believe). At 5:30 they all went to Dave McGillivray’s talk. I could have joined but I wasn’t sure if there were spots left and I hadn’t registered. I also used cash at Panera (oops), so I couldn’t pay at the door. 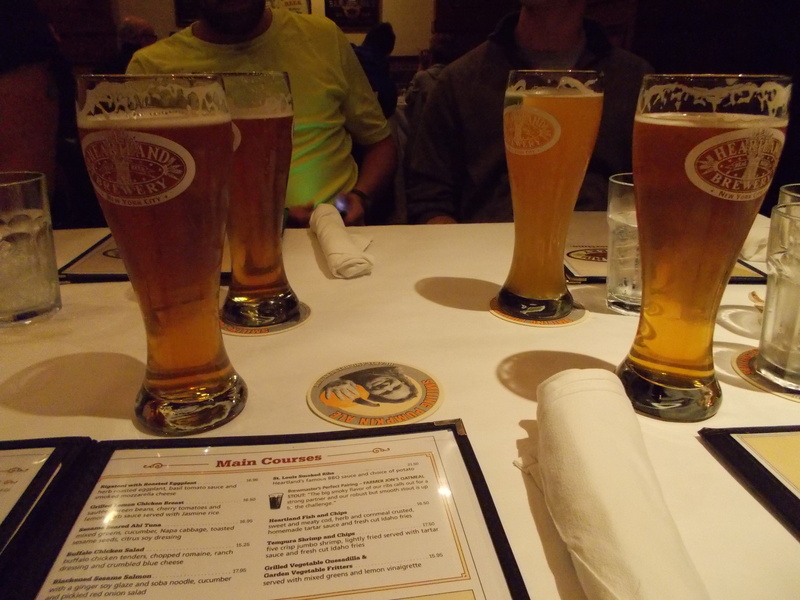 I did have enough cash for…an expo beer! That’s right, there was a bar at the expo venue, and the beer was cheaper than at Princeton bars. ‘Twas a win. I was happy to enjoy a Shock Top while sitting with Jane on the deck overlooking the steel stacks as the sun set. It was good to relax and reflect on my race with her (and get her excited for her own!). Summary: the steel stacks were beautiful with the purple lights shining on them at night, and expos are more fun when they are attended after a great race and they have a bar. 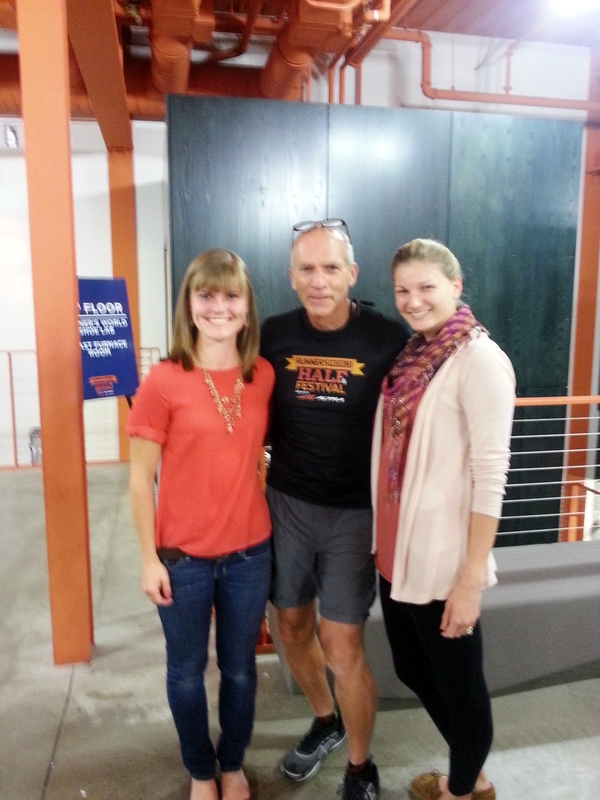 We snuck in a pic with Bart Yasso before leaving! Even with a new phone it’s unfortunately blurry. 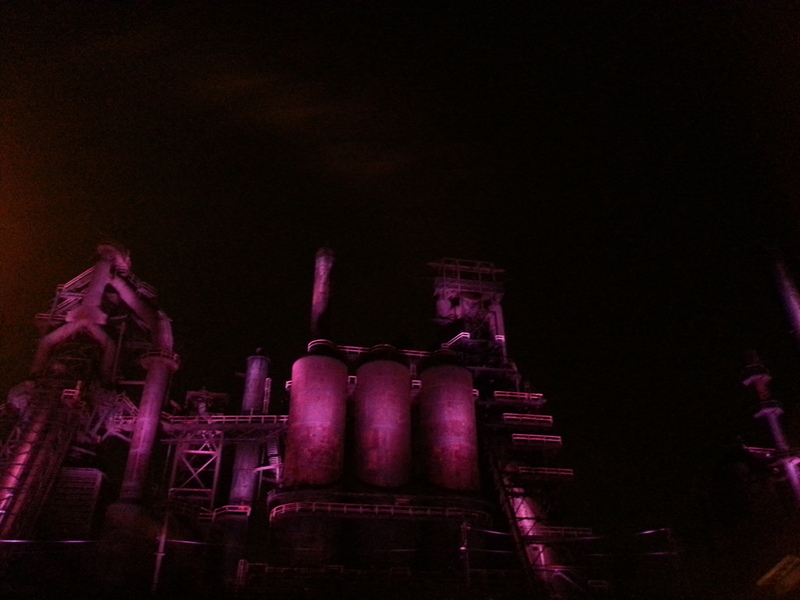 Steel stacks at night. See the first photo in this post for the sunset snapshot: so pretty. Oh, and that’s a steel arch of fire, by the way. There were so many people who did the hat trick this weekend (all three race distances over two days) that it was really easy to belittle the fact that I only did the 10k. Honestly, I was even thinking, back when I heard about the event a couple months ago, that I would come and just go to the seminars and network with people. Then I realized I wasn’t so scared of getting hurt anymore, but I was through with 5ks for now, and the half would have been a bit much if I really went for it in the 10 miler the week before. Because we all know I can’t run something for fun wearing a bib number. So, the 10k was my choice. Then there was the timing glitch, which I’m still kind of confused about. 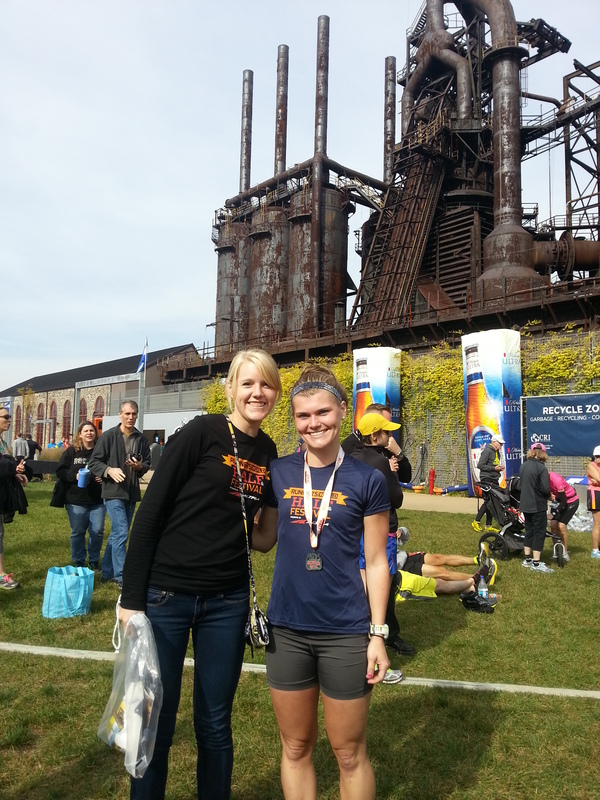 I was pretty distracted immediately after the race for the rest of the day, meeting new people and hanging out at the expo and being a runnerd, admiring the steel stacks and the RW dinner – all of that. So, it’s easy to dismiss the race with, “I’m happy with it, I ran a PR, I had a great day, I can write a blog post about it (ha, really though), I’m one step closer to the Philly Half.” I don’t have a problem giving the race the credit it deserves though, so I will. Regardless of the context and the controversy, that 10k was the best race I’ve ever ran. I said that last week. This was better than last week. The girl I passed in the last mile this week was the same distance away from me as Allison was last week at some point. Instead of doubting my ability to push harder and not be nervous by the pace given the distance ahead, I went for it and boldly passed her. I used each runner ahead of me to push myself and not get complacent. Every race teaches you something about your limits, but this one especially was a breakthrough for me. I learned last week, and in recent workouts, that I can finish faster and not get “tired” (unless a 20 mph wind slaps you in the face but that’s a different story). The question I asked myself subconsciously this week was, how much faster? I plan on asking that question now each time I race…but I suppose that is what racing is, isn’t it? The stats. I did a little math and the last 5k was 19:59…what?! 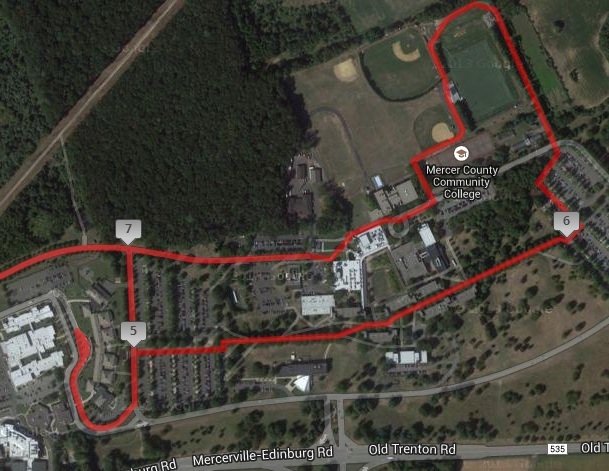 *Note: My previous 10k PR was ~42:30 at the 2012 Princeton Healthcare 10k. We were directed the wrong way so I ran 41:14 for what was re-mapped as 6 miles, 6.02 on someone’s Garmin. So, I extrapolated, since I definitely could’ve kept going for 0.2. 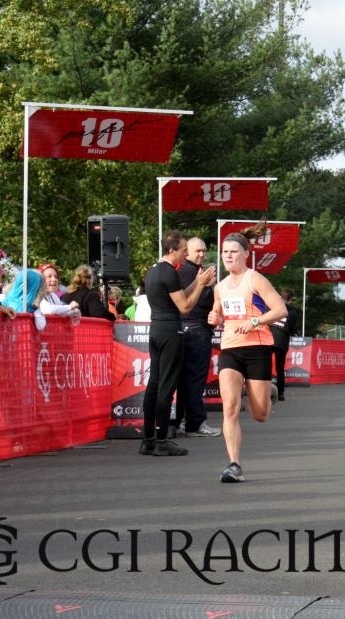 Actually, last week’s 10k split was basically my PR (the first or the last). After that fiasco I certainly hope RW gets my time right after results are official (the 42:16 I see now is wrong)! If not maybe I should stay away from 10ks. 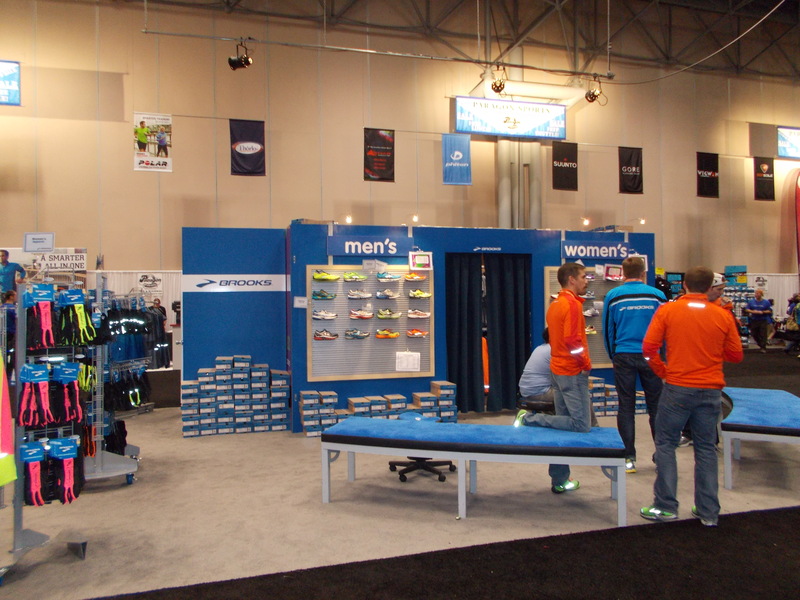 Working at the Running Company and consequently being surrounded by shoes and runners all day, we have heard it all. From recounts of doctor experiences to descriptions of shoe wear patterns to stories of past running shoe experiences, customers tend to tell us a lot of things about their shoes. This can be helpful in recommending their next pair…however, there are comments at which we find ourselves constantly cringing. Sometimes these statements are heard within our walls everyday, making them almost cliché. Okay, a little comical, actually. Here are some of the top running shoe myths we regularly hear, and why they aren’t true. If you think you may be guilty of them…please read on and be enlightened…. Podiatrists seriously need to get over their infatuation with New Balance. Don’t get me wrong, New Balance is a great company that makes awesome running shoes. They’ve even been very innovative in the past year, improving on some of their running shoes immensely, and doing things like snagging the road racing flat of the year. The issue with this statement is, you can really replace NB with any and every other company. New Balance may have been one of the first companies to make widths readily available to the average shopper looking for a good shoe; however, nearly every running shoe from every company now comes in wide and narrow widths. In fact, in our store we stock more widths in other brands than we do in New Balance: Asics GT-2000, Asics Nimbus, Saucony Ride, Nike Vomero, Nike Structure, Brooks Adrenaline versus the New Balance 990, currently the only NB shoe we have in wide widths! Most of the top-selling shoes are available in 2A (narrow women’s), B (narrow men’s, medium women’s), D (wide women’s, medium men’s), 2E (wide men’s, extra wide women’s), and 4E (men’s extra wide). So, the next time you fall in love with a shoe but it’s just a tad too tight – ask if you can get it wider! Chances are, you can. Even without a big “N” on the side of the shoe, I promise. There are two more things to keep in mind: 1.) A mid-foot strike would generate a wear pattern that looks like the middle shoe above, but without wear (or much of it, anyway) near the heel, and 2.) You can only get a limited amount of information from looking at the wear pattern on your shoes. the best way to really understand how you are running and what you need is to get to a store and have your gait analyzed on the treadmill and/or as you run down the sidewalk (sometimes they produce different results, trust me!). Whoa, whoa, whoa, hold up. I’m not sure there is a single brand that can be categorized as “bad” as a whole. Some running shoe companies make only higher-quality running shoes, meaning there are no models that retail for less than ~$80 and all have pretty sound cushioning systems (e.g., Brooks, Mizuno). However, most brands make “cheaper” shoes that are abundant on the shelves of department stores and retail for $50 or less. Put enough of these on the market, make them attractive enough, and advertise them as “running shoes,” and you will certainly get a lot of complaints from runners trying to get 40 miles per week out of them. Maybe even 20. Nike is a culprit of this practice, and it’s actually fine – if you let the half-mile dog walkers and the gym class-goers purchase them for those purposes only. Nike makes plenty of superb running shoes in addition to their sub-par models – those are the ones you want to try. 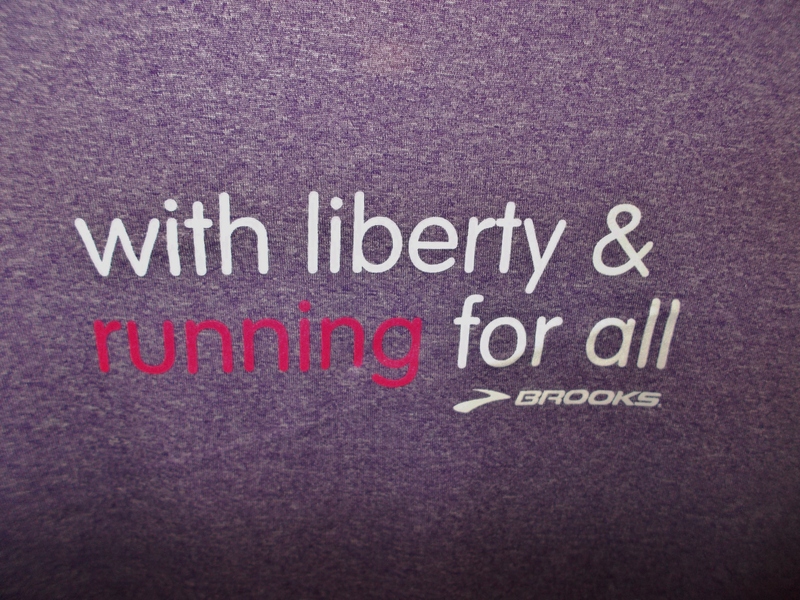 Another reason someone might believe the above myth is…the Nike Free. I’m not sure why, but in some people’s minds, the Nike Free = Nike. This is obviously not true. Frees are flexible and not supportive…they work for some people, not for others (like any other shoe). It shouldn’t define Nike as a brand though. Need some support? Try the Nike Structure the next time you come in for a new pair of shoes. You might be pleasantly surprised. Are you a neutral runner who likes a lot of cushion? If you haven’t worn the Vomero or Pegasus, don’t knock on Nike. Back in the day, before I knew what I was doing, I wore cheap Nikes…in a race for that matter!? I have since learned, obviously. When we talk about having a high or low arch, we are usually referring to the height of medial longitudinal arch with respect to the ground on which we are standing. Usually, if your arch is “high,” it is stable, meaning it stays upright throughout the gait cycle and you are a neutral runner needing no extra support from your running shoe. A running shoe with stability could cause you to not pronate enough, which is just as bad as overpronating. There are occasions in which a high arch is also very flexible and needs more stability, but this is a rarer case. It is not wrong for someone with a high arch to want to feel “support” though. A stable shoe is not the answer though; all shoes are flat inside. Now, there are some that have a more narrow platform in the center, which might feel better given the shape of the foot’s arch. What a runner with a high arch should consider is actually an insert such as Superfeet or Powerstep to fill in the gap between the arch and the shoe. While it’s not necessary from a visual/biomechanical standpoint, its addition has many benefits, such as plantar fasciitis prevention, comfort, and increased toe-off efficiency. Another note about Superfeet: the different colors aren’t just for fun! Each (Berry, Orange, Green, Blue, Black, and Carbon – new at PRC!) are a little different, and what works for the unique combination of your foot + your shoe depends on a number of factors. As always, let us know if you aren’t sure why you have the color you have, or if you should try something different. There are only subtle differences…but how many steps do you take on a run?! It all adds up, and the key is to be comfortable and supported. Well, I’ve got to get back to work…chances are I’ll hear about five other myths throughout the course of the day and kick myself for not including them in this post. What questions do you have for me? I’m down for dispelling myths all day, so ask away in the comments! Don’t be shy! 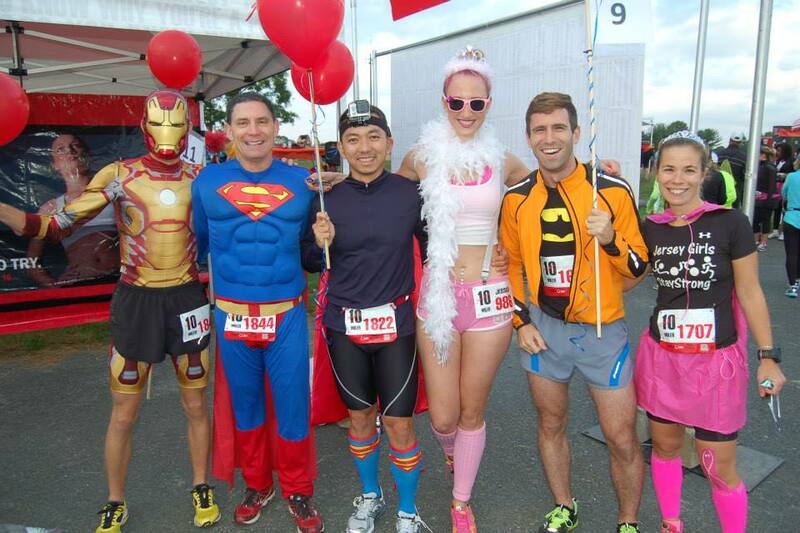 On Sunday, I ran a race with about a thousand friends. Or so it seemed, anyway. 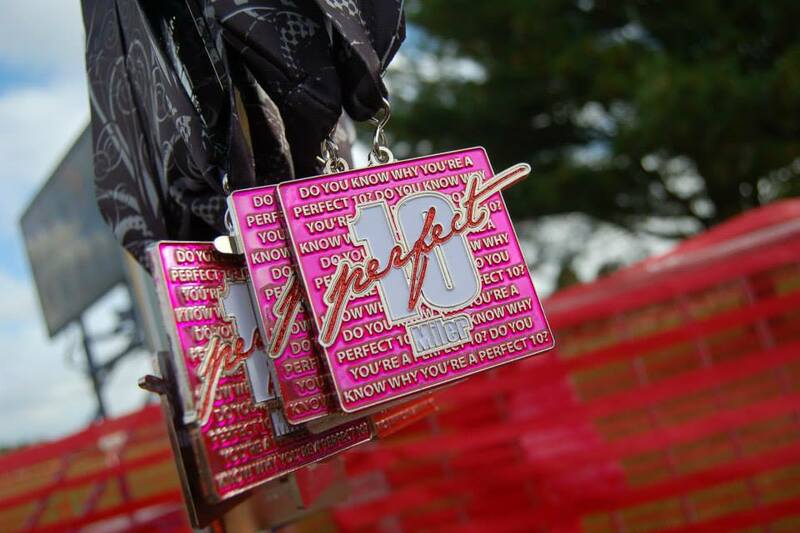 The Perfect 10 Miler was truly an event to remember, as I thought it would be. Here’s how it unfolded…. Some of the pacers pre-race. Proof that I did indeed get my lucky #13. Going into the race, I had no idea what to expect as far as competition was concerned. Jason (coach who organized the pace groups) told me at the expo the day before that Steve was sort of his “just in case” pacer, because he didn’t think many women were going to run seven minute pace. On the other hand, this was a CGI race, and their other races, like the Rutgers Unite Half and the NJ State Triathlon always attract fast runners/triathletes. So, Steve and I could be out there running alone in front, or I could be hanging on to the top twenty or thirty, or something in between. We wouldn’t have a clue until the gun went off. Okay, that’s a lie. 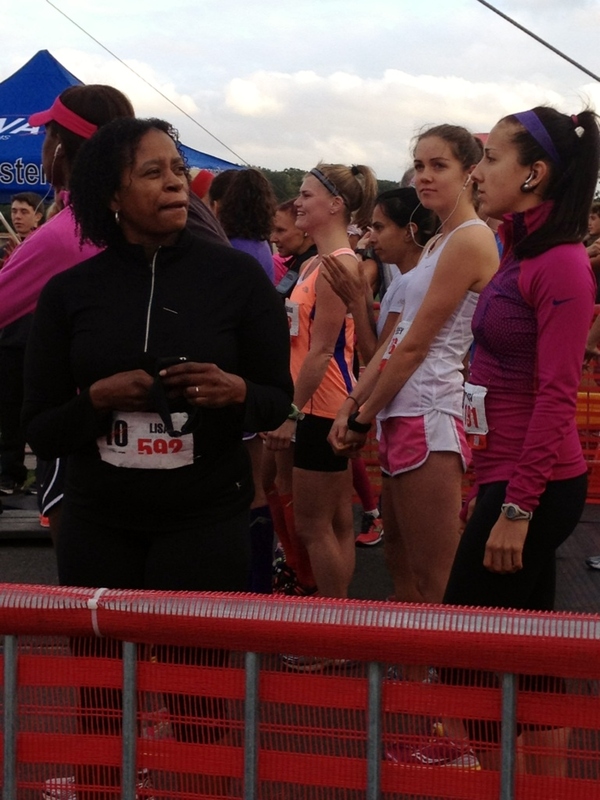 We chatted on the start line, like any curious, nervous runner would do. A couple women said something about “6:45s,” so I knew then that I wouldn’t be alone. I still was almost literally toeing the line, my first time at the very front in a race with an actual timing mat! That was pretty exciting. I was just behind the very front though, because again, I didn’t know what to expect. Ready at the starting line! One thing I remember feeling that surprises me now is, I wasn’t nervous at all. This might be a first for me. I was just purely excited to see what I could do…and of course, distracted by all the costumes and happy people surrounding me. When the race started, of course people went out blazing fast. The old me would have gone with them and busted out a 6:30 first mile, to “have something in the bank.” Not this time though: why should I race that way if I’ve ran every single run with a negative split recently and felt great? So, that was the plan. I’d thought 7:00 would get me in a nice, comfortable spot through halfway, maybe even over 7:00 at times in the very beginning. However, I settled into 6:50s really easily, and it felt just that: easy. It felt like 7:30. There was no need to slow down with my heart rate and legs in check like they were, so I didn’t. This meant that I actually ran ahead of Steve the entire race. I could hear him talking behind me though, telling the runners around him they were right on a seven minute pace. The best part of the entire race came after the first turn-around, where we crossed onto the other side of 2-lane Paxson Ave. and could see the rest of the runners heading out in the opposite direction. First, it looked pretty sweet because there was a total of 1,432 runners, and the crowd hadn’t thinned out yet, since it was still the first mile. Second, it turns out I have some sort of fan club. All of a sudden, Brennan cheered my name. Then Lisa (and another Lisa). Then Stephanie. Then Anne and Michelle. Then Jody. Then others I can’t even remember now. It got to the point where the woman I was currently running alongside was definitely amused, and I was trying not to laugh (laughing + running = not the best). “I’m not famous, I swear,” I said. All the cheering and waving gave me a mental boost, and I did a good job of saving it instead of letting loose and dropping a too-fast mile so early on. The loop around the West Picnic Area lot was another spot where I saw runners going in the opposite direction. I was in ninth place then, I counted. Steve was still pretty close behind me at that point, but I felt myself pretty quickly gain ground on two women ahead of me. 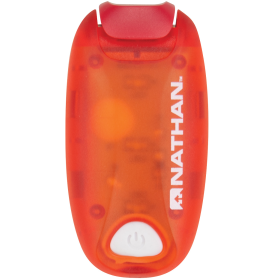 I checked my watch and saw I was running the same pace, so they must have slowed down…so I moved right on past. Hughes Dr. is a bit of an incline, so the fifth mile started out a little slow. I managed to drop the girl who was running next to me here though. Just as I got onto campus, I passed another girl, who had been in second or third last I checked. It was time for the fun part now; I had done these sections at this pace the week before. So, we still got to blaze straight through the middle, after the little turn-around, where I got to gauge my place again (I was now sixth, and the girl I broke away from wasn’t far behind). There was a rock band playing at mile 5.5 actually, which was pretty cool. At that point I was kind of alone, just chasing one girl, so it felt a little weird. Sorry for not cheering or anything, guys. Hopefully I smiled or something. The clock sitting at mile six indicated I was running basically the same average pace as my 10k PR (from last summer). I still felt like I had a couple more gears, one of which I had switched on just as I entered the straight walkway through campus. This was subconsciously my plan (I think). At the turn by the softball field, the girl just ahead of me started to continue straight, so I yelled, “go left!” (I’m too nice to have let her find out when she reached a random grass field and tree line…). We entered earshot of the band again, and ran onto the road leading to the trail that would take us back to the park. The effort was beginning to feel harder at that point, but I had dropped down to 6:35-40 by then, so that made sense. One good thing about the course being different from what we’d thought was that by the time we got off the path and onto Paxson, mile eight was actually done. Then, THE WIND came. I am not one to complain about the elements; they are race conditions one cannot control. 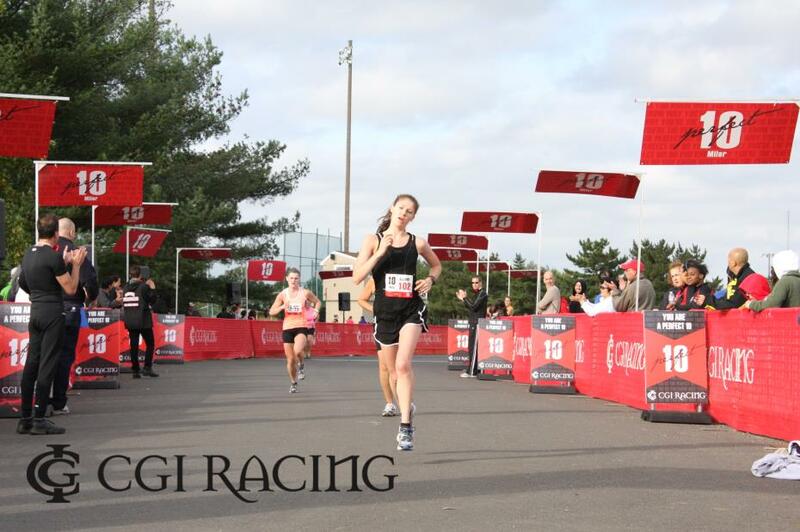 But OH MY GOSH THE WIND DURING MILE 9 WAS HORRIBLE. I guess I never experienced being held back by the wind during a race before. It certainly made up for the course being pancake flat – there might as well have been a big hill on Paxson right there. I was gaining on the girl ahead of me, but I felt like we were running the same exact pace, and the wind was sucking the energy I would’ve used for a two-mile kick out of me. I couldn’t wait to turn right just to get out of the direct headwind (and it was very direct). It got marginally better. There was more of a crowd on that small road, and a couple guys said my name and told me to “go get her”…not sure who you were but thank you, I really did try! I kind of wish I could go back and re-do this ending (and smile for the camera at the finish…I still look like I’m wind-battered) – catch the girl and steal the AG win and the last spot on the “Leaderboard” chart at the top of the results…but it didn’t happen. And I guess it’s okay. I kicked it in as much as I could at that point and finished sixth overall with a time of 1:08:24.2 (miles 9 & 10: 6:55, 6:32). I placed second in my age group (F20-24), missing first by 1.7 seconds…but as I explained, it was one of those instances when more ground would have been needed for me to make up that time; I was significantly farther away from her a mile or two before! I seriously smiled for the first eight miles…where are those photos?! I want to photoshop out my face, ha. If you were wondering how Steve did with his pacing duties after last weekend‘s speedy course preview tempo, the answer is very well: 1:09:48.1, finishing just three places behind me. He was almost invited onto the podium to receive his first place 25-29 female award, but it was quickly realized he was a.) a pacer, and b.) male. When I went up to receive my AG medal, I learned that the girl I’d been chasing for the whole race, Allison, works at another Running Company (in NYC)! 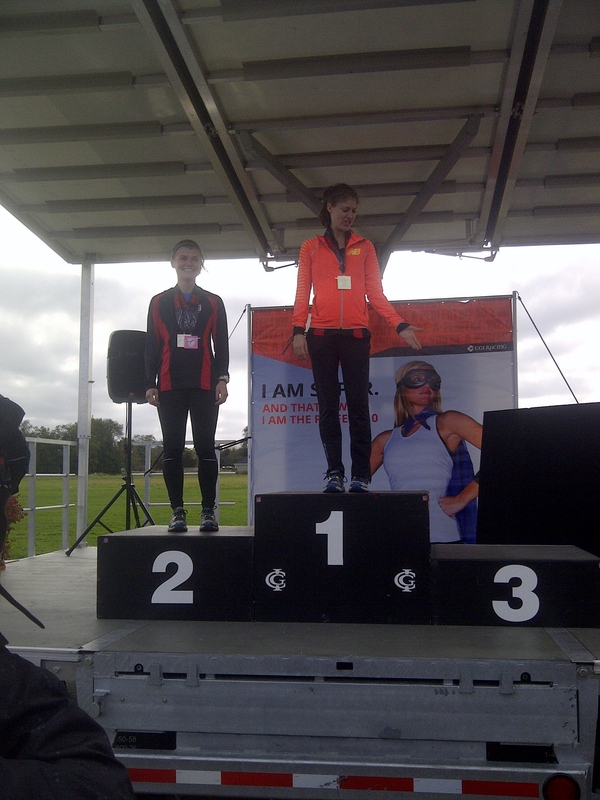 Her mom ended up winning her age group too. So, I would’ve ruined it for them if I’d beaten her in the last mile, right? We’ll just leave it at that. It was like a party with a 10 mile PR in the middle. Can it get better than that? Oh wait, yes, I forgot to take a picture of the banana I had dipped in chocolate. And [good] beer. That’s excusable, I think. 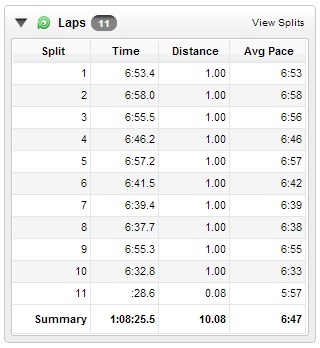 Already wrote splits, but just to consolidate….No sevens = success. Aside from the awesomeness of the event as a whole, I believe this was actually my best race to date. 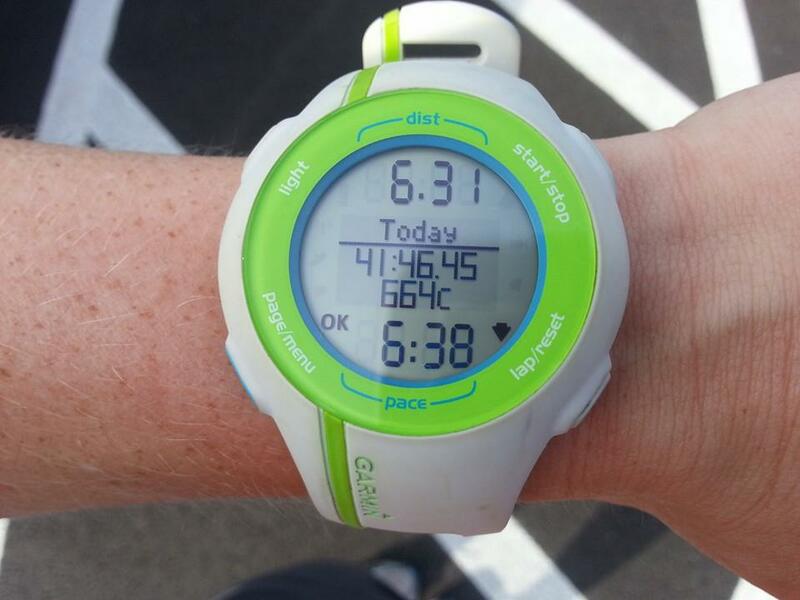 Never before has 6:50 felt such like cruising pace, nor has dropping the pace to 6:37 felt so automatic. I know that if not for the insane wind, I would have been able to hold that pace for the ninth mile also. I remember doing tempo runs in college and not being able to average under 7:00 for four or five miles. My first mile would always be the fastest, and I would always get really nervous before the run began. The Perfect 10 felt like a celebration of finally having overcome all of that. I’m finally at the point where I can make goals for myself, respect those goals for what they are, fear them a little bit, and then make sure I obliterate them. 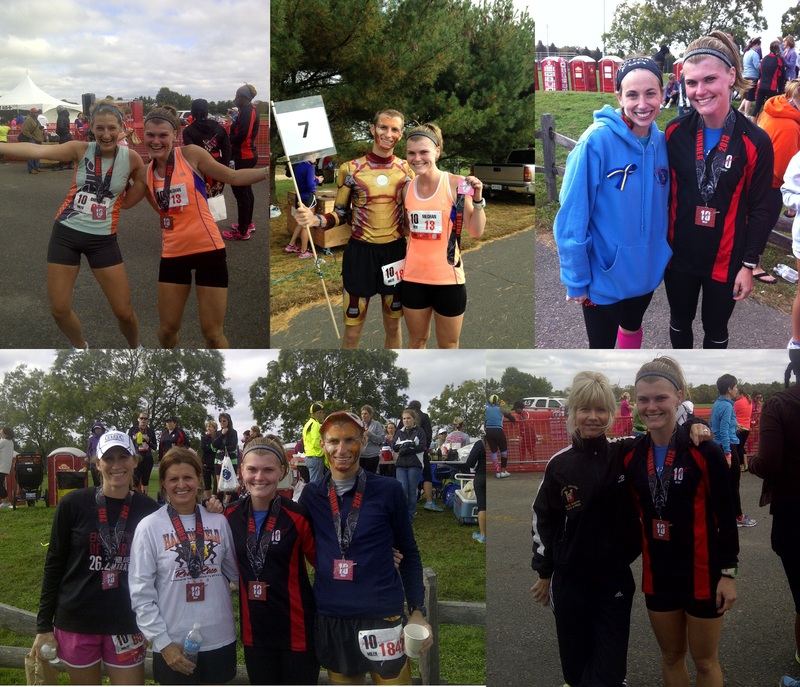 It’s time to look forward to the Philadelphia Half Marathon now, and I wanted to use the Perfect 10 as a guide for setting my goal. I was going to run it with Steve and he isn’t able to do it anymore, but our loose plan since the day we registered was always “sub-90.” Translation: that was his plan and I was skeptical I could keep up, but I was planning to try. Now, after Sunday, I am going to officially set it as my goal. A couple more miles at ~6:50 before I pick it up, and I should be at under a 6:52 average for 13.1 without a problem. 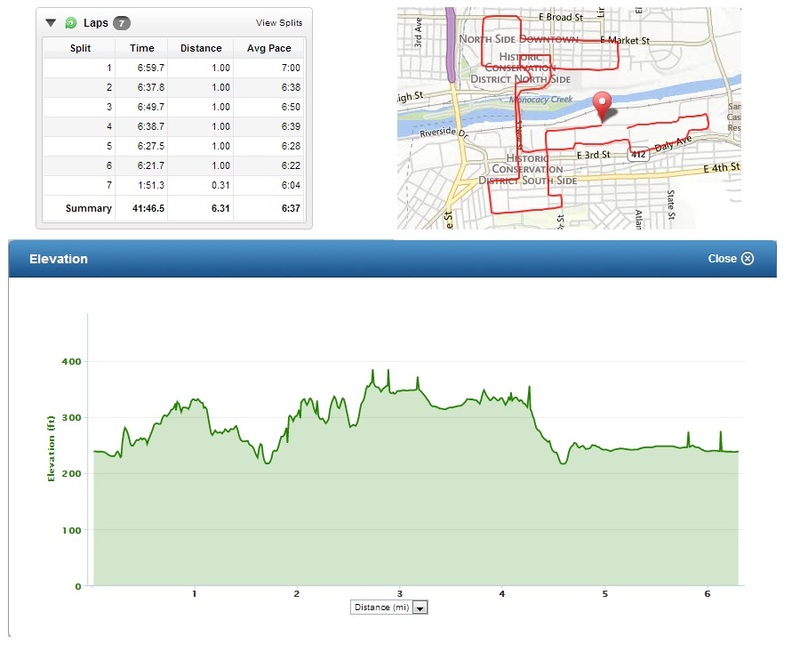 (My B goal would be to average under 7:00, i.e., under ~1:31:40). A sub-1:30:00 half is definitely no easy task though, and I understand that my 10 mile time doesn’t necessarily correspond to that goal. I think it might be good for me to go ahead and say something scary like that, and see what happens. That being said, don’t let me continue and run 26.2 a month from Thursday. That is off-limits ’til April 21….